Headlinesman will place a clip on the chain at the edge of the line closest to the rear stick in order to make measurements and to set up for 2nd and 3rd quarters. For ease of recognition, officials are traditionally clad in a black-and-white vertically striped shirt, black pants with a white strip down the side, with a black belt, black shoes, and a peaked cap. 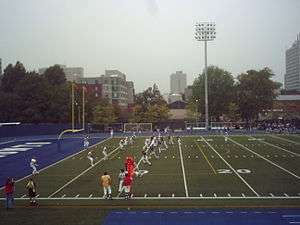 The referee can be seen with the white cap behind the offensive team (in blue) in this CIS football game. The referee is responsible for the general supervision of the game and has the final authority on all rulings. Thus, this position is sometimes referred to as head referee and is considered to be the crew chief. He can be easily identified by his differently coloured cap. In the Canadian Football League (CFL), the referee wears a black cap while the other officials wear white caps. In amateur football, including CIS football, the referee wears a white cap with black piping while the other officials wear black caps with white piping. During each play from scrimmage, the referee positions himself behind the offensive team, favouring the right side (if the quarterback is a right-handed passer). He also counts offensive players. On passing plays, he primarily focuses on the quarterback and defenders approaching him. The referee rules on possible roughing the passer and, if the quarterback loses the ball, determines whether it is a fumble or an incomplete pass. On running plays, the referee observes the quarterback during and after he hands off the ball to the running back, remaining with him until the action has cleared just in case it is really a play action pass or some other trick passing play. Afterwards, the Referee then checks the running back and the contact behind him. During punts and field goals, the referee observes the kicker (and holder) and any contact made by defenders approaching them. In the CFL and other professional leagues, and in some CIS football games, the referee announces penalties and the numbers of the players committing them, and clarifies complex and/or unusual rulings over a wireless microphone to both fans and the media. During instant replay reviews in the CFL, the referee confers with a replay official, who is located at the CFL head office, on the play and then announces the final result from the replay official over the wireless microphone. In addition to the general equipment listed above, the referee also carries a coin in order to conduct the pregame (and if necessary, overtime) coin toss. The umpire (U) stands behind the defensive line and linebackers, observing the blocks by the offensive line and defenders trying to ward off those blocks — looking for holding or illegal blocks. Prior to the snap, he counts all offensive players. During passing plays, he moves forward toward the line of scrimmage as the play develops in order to (1) penalize any offensive linemen who move illegally downfield before the pass is thrown or (2) penalize the quarterback for throwing the ball when beyond the original line of scrimmage. He also assists on ruling incomplete passes when the ball is thrown short. As the umpire is situated where much of the play's initial action occurs, he is considered by many to hold the most dangerous officiating position. In addition to his on field duties, the umpire is responsible for the legality of all of the players' equipment. The head linesman (H or HL) stands at one end of the line of scrimmage (usually the side opposite the press box), looking for possible offsides, encroachment and other fouls before the snap. As the play develops, he is responsible for judging the action near his sideline, including whether a player is out of bounds. During the start of passing plays, he is responsible for watching the receivers near his sideline to a point 5-7 yards beyond the line of scrimmage. He marks the forward progress of the ball and is in charge of the chain crew in regard to its duties. In addition to the general equipment listed above, the head linesman also carries a chain clip that is used by the chain crew in order to properly place the chains and ensure an accurate spot when measuring for a first down. The line judge (L or LJ) assists the head linesman at the other end of the line of scrimmage, looking for possible offsides, encroachment and other fouls before the snap. As the play develops, he is responsible for the action near his sideline, including whether a player is out of bounds. He is also responsible for counting offensive players. During the start of passing plays, he is responsible for watching the receivers near his sideline to a point 5-7 yards beyond the line of scrimmage. Afterwards, he moves back towards the line of scrimmage, ruling if a pass is forward, a lateral, or if it is illegally thrown beyond the line of scrimmage. The field judge (F or FJ) works downfield behind the defensive secondary on the same sideline as the line judge. He makes decisions near the sideline on his side of field, judging the action of nearby running backs, receivers and defenders. He rules on pass interference, illegal blocks downfield, and incomplete passes. He is also responsible for counting defensive players. He has sometimes also been the official timekeeper. The side judge (S or SJ) works downfield behind the defensive secondary on the same sideline as the head linesman. Like the field judge, he makes decisions near the sideline on his side of field, judging the action of nearby running backs, receivers and defenders. He rules on pass interference, illegal blocks downfield, and incomplete passes. He also counts defensive players. During field goal attempts he serves as a second umpire. The back judge (B or BJ) stands deep behind the defensive secondary in the middle of the field, judging the action of nearby running backs, receivers (primarily the tight ends) and nearby defenders. He rules on pass interference, illegal blocks downfield, and incomplete passes. He covers the area of the field in between himself and the umpire. He has the final say regarding the legality of kicks not made from scrimmage (kickoffs). In CFL football, the Replay Official is not located at the stadium, rather at the CFL Command Centre at the CFL Head Office. The Replay Official is responsible for the final determination of challenges made by the two team's head coaches; and in the final 3 minutes (and all of overtime) of the game initiating a review of any play they believe warrants such attention. The Replay Official also reviews all scoring plays during the game. When a review is underway, the Referee speaks to the replay official via headset at the sideline. The Replay Official has the final call over all challenges and reviews. CIS and other leagues in Canada do not utilize the replay/review process. Junior football, high school football, and other levels of football have other officiating systems. A three-official system uses only the referee, umpire, and head linesman. It is common in junior high and youth football. At those levels, it is also common for the umpire to line up in the line judge's position on most plays. A four-official system uses the referee, the umpire, the head linesman, and the line judge. It is primary used at lower levels of football, including junior varsity and some high school varsity. A five-official system is used in arena football, most high school varsity football, and in most semi-pro games. It adds the back umpire, with duties similar to the back judge from the seven-man system, to the four-official system. A six-official system adds a back judge and back umpire to the four-official system. Of the two added officials, one is on the middle of the field each play, similar to a back judge in a seven-man system, while the other is on the sideline, similar to a field judge or side judge. It is used in some high school and small-college games. 1 2 "Archived copy" (PDF). Archived from the original (PDF) on May 11, 2012. Retrieved August 5, 2013. 1 2 Berry, Walter (ed.). The Canadian Amateur Rule Book for Tackle Football. 2014–2015. Football Canada. p. 18.